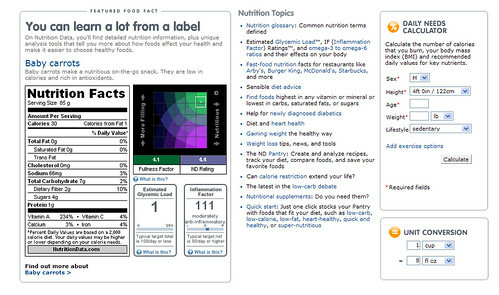 A Life of Sugar and Spice: A "salad" is not always "healthy"
I just stumbled across the best nutritional website EVER. How did I not know of this years ago? I've been a member of calorieking.com for years and I find the food diary very difficult to use, so I never log anything, so I gain weight. Excuses, excuses, I know! But seriously, now I'm determined to get back to logging my intake everyday now that I've determined I need to monitor my sodium and potassium. Not to mention the fact that I'm plumping up faster than a Ballpark Frank in a pot of boiling water. You get your own "pantry" to store all of the foods you eat, then you can get complete and extensive nutritional information, including a printable nutrition label. 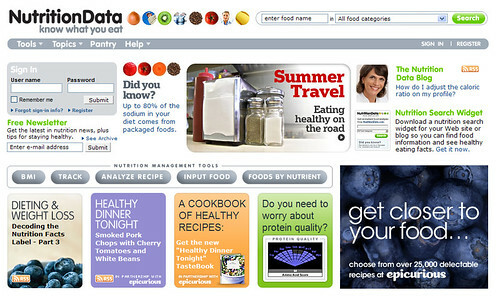 You can put food together to get recipe info or meal info, any way you want to break it down. I input the salad that I had for lunch today and I was [not] surprised to see that it was very high in calories (potato salad on the side...). I have got to stop this weight gain and I'm hoping this gem of a website will help me with that. Too cool! I am totally using that site. I swell up so badly too, and that's not even with meds. It's funny how, especially after working out, I feel "fatter" because that's when I tend to retain the most water. Welcome back from vacation! And tell me all about Flatbread when you get back. I'm pretty sure I'm making the trip there tomorrow night. I use this site for everything! I input and save my recipes, and my most frequent meals, and then I do one big "label" for each day so I can see the whole thing all together, and my percentages. LOVE this. Sounds really cool. I am going to check it out for sure. Thanks for the great info.